With JSP negative ion foot detox system, It helps to charged the atom or molecule that has gained or lost an electron, thus creating an electro-magnetic field capable of neutralizing oppositely-charged particles such as toxins found in the human body. The negative ions produced by the JSP negative ion foot detox system create a gentle vibration that aids the release of unwanted toxin particles through the pores on the sole of the foot. There are over 20,000 pores on each foot, Negative ion producing technology has been around for several decades, but the secret to its successful use in body detoxification and cleanse is the effects of positive and negative ions. During our normal day to day activities, our bodies are exposed to harmful toxins which are everywhere in our environment. From tobacco smoke, alcohol, food additives and pesticides, to heavy metals and industrial pollutants, our bodies absorb these toxins which prevent us from functioning at our best. All the things below can effect our well being. * Poor diets - food additives, processed foods etc. Although our bodies detoxify naturally every day most of us lead busy lives that make it impossible for our bodies to eliminate these toxins completely, which leads to a build-up in our systems. Unfortunately, we often do not realize this until too late. Our bodies cope less and less well withthis harmful toxin build-up, our immune system starts to break down and inevitably we become ill. e.g. The JSP negative ion foot detox system delivers an electrical current through the ionizer array that is placed into the water alongside the feet. The low-level direct current to the array causes the metals within the array in combination with water and salt to generate positively and negatively charged ions by separating the oxygen and hydrogen components of water. The ionic detox / foot spa hydrotherapy detox/cleanse system allows the negative ions to travel through the body and attach themselves to toxic substances with the opposite charge. Since most toxins in our body are positive in charge, (i.e. 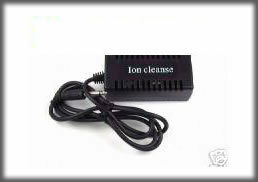 heavy metals ions), they will be conveniently neutralized and drawn out by the negative ions produced by the ionic detox and cleanse foot spa . Toxin particles are pulled through the skin and out of the body via osmosis and neutralized because they are attracted by the highly-concentrated ion field in the ionic detoxification and cleanse footbath water. When the ionic detoxification and footspa is set, the negative ions being produced in the water raises the user's pH to a more alkaline state. This is significant because the vast majority of people in the United States live in an acid state — their bodies contain an excess of hydrogen ions and their pH is lower than 7.45. Such persons greatly benefit from exposure to high concentrations of negative charged ions, bringing their bodies back into a more balanced acid-alkaline state. This is very significant, because when your body is alkaline, the cells causing many diseases, such as cancer cannot grow! The JSP negative ion foot detoxification helps the body release the incredible power of our immune system! Every day our immune system defends us from pollution and foreign invaders, including our own cells when they mutate into cancer causing cells. Did you know that only your immune system can repair, heal, and cure you of illness and disease? Look in any medical textbook or ask any doctor and they will tell you that any illness that goes away as a result of a prescribed course of treatment or procedures is also destined to return when the treatment does not include paying attention to the important role of the immune system. If a patient is not taught to acknowledge the importance of changing their lifestyle to better support their immune system, as part of their long term recovery plan, the old disease or some other new one is almost always certain to re-manifest. After each negative ion foot detox/detoxification session, it is common for users to to feel an immediate relief from disease and illness symptoms. However, even though you may feel this relief, it is important to note that ionic detoxification and cleanse footspa treatment sessions do not heal nor cure any diseases or conditions. The role of the negative ion detox should be viewed as that of a relaxing alternative therapy for helping the body to reduce unwanted toxins on it's own; it is only an aid in the healing process carried out by your own immune system. According to the theory of Nutritional Immunology, only your immune system can heal your body and cure you of your illness and disease. So a relaxing ionic detoxification foot spa is only a valuable way of assisting the body to detoxify and cleanse its organs and tissues on it's own. This detoxification and cleansing process carried out by your own body, miraculously aids in the healing process carried out by our immune system. 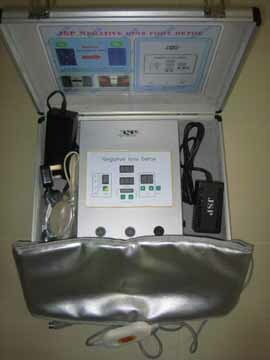 The JSP negative ion foot detox hydrotherapy sessions aids the body in its detoxification and cleansing benefits – it assist restoring body vitality against environmental toxins by eliminating the chemicals you take in from drugs, environmental pollution, and foods (particularly processed foods and meats). The benefits go on however we cannot make medical claims so we are unable to list them here, but we will list the benefits of detoxification, proper dietary modification and following the detoxification checklist below. The key is proper nutrition & an effective cleansing modality! 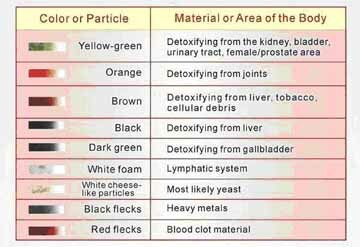 During the course of using an JSP negative ion foot detox system, the water will most likely change color and bits of foreign matter may appear as sediment. This is to be expected. It is caused by a reaction between the material from a user's body and particles in the water, salt added to the water, the metals in the ionizer array, and the acidity or alkalinity of the user. It is important to understand that the water will change color and particles may form even if the unit is operating without feet in the water! This is because of the fact that the color change and objects in the water can be caused by so many factors as mentioned previously, for example: the consumption of the metal inside the array; the sea salt added; substances leaving your body through your feet; any dissolved materials (in addition to toxins) already present in the local water supply you are using; and even the air surrounding the spa water! There is so much confusion, and rumors circulating out there because people are focusing so much on color charts, which only show final color change after a session, when in fact the final color change actually doesn’t really matter at all; it is only the speed of this color change progression which really matters and can be compared from one user to the next; even so, at best color change progression analysis, is only a speculative science that should be left to professional practitioners with training. If you want to know if the technology works, you be the judge; Just come and try out the technology by visiting one of our locations for a few sessions before you buy a machine. You’ll probably notice changes in your body and health just after two or three sessions! We are confidence you will conclude it works!!! Following a consultation, the treatment commences by placing both feet into a foot spa with the ionizer array and warm water. Treatment time is 30 minutes and throughout this period the water will gradually change color. On completion of the treatment, the feet are removed and rinsed. After a session some people report the experience of feeling lighter, with a greater sense of overall well being, increased energy and improved focus. Many people with pain, edema, gout, and swollen or deteriorating joints have reported considerable symptomatic relief from their relaxing ionic detox and cleanse footspa session(s); however these are only examples of reported beneficial side effects that we have extracted from the testimonial of customers. Ionic detox and cleanse foot bath sessions is not intended to be a therapy, cure or medical treatment for these or any other illnesses. Please see your physician for medical conditions! If you would like to experience the detox process for yourself, Don't buy a the detox system if you are not sure whether it is beneficial to you, there are many treatment centers and participating healthcare professionals providing these services. Call to book an appointment. Home visits are also available in some areas. Our delightful, relaxing 30 minute therapeutic foot detox session provides energy balancing and total body detoxification through the use of ionization. This is a wonderful complement to all healing modalities. For maximum results, a course of 6 treatments sessions is recommended over a 3-week period with the treatments equally spaced apart. Get Rid Of Your Toxins At The Comfort Of Your Own Home! Buy or rent your own machine & stay healthy, without having to spending money on sessions. Our JSP Negative ion foot detox system are the most affordable ionic body detox units you can buy with all the sophisticated standard features, replacement arrays are in-expensive and easy to maintain; just plug it in and throw it away after thirty to forty uses. JSP Negative Ion Arrays use only the most advance Ionizer Technology! These are custom built arrays. Order today and experience the difference.